207 pages. 6" x 9". Softbound. Filled with incredibly crisp, clear, cutaway drawings, exploded views, how-to pictographs, and photos; complimented by very readable, detailed text, dimensioned close ups of all the components and valuable tricks of the trade. 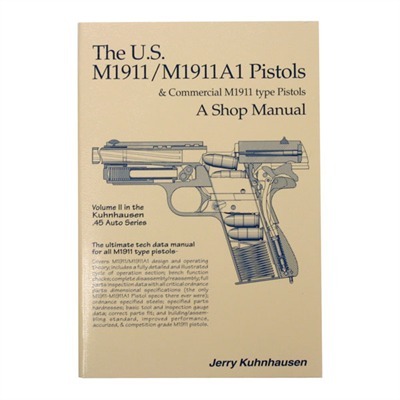 If you want to understand the 1911, how it functions, what causes it to malfunction and how to fix it, you must have this book. Includes what are probably the best set of instructions for fitting a custom barrel available to date. Jerry Kuhnhausen illustrates how to fit parts to the proper dimensions and install them correctly - a must whether you're building duty guns, casual plinkers, or match winners. Even the index is well laid out and useful. An excellent reference work and practical how-to manual.